I was out of town the end of last week through the beginning of this week so I didn't have much time to review anything for this week...but I did find some goodies online. 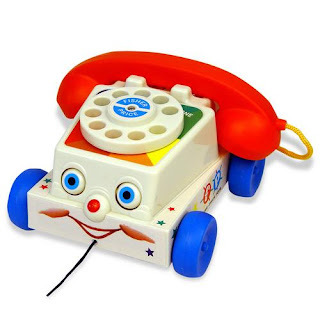 Fisher Price has released some of their retro stuff including the Chatter Telephone pull toy. It's pretty much the same one that was around when I was a kid, although I assume there is less lead in the paint...hopefully no lead. The eyes still roll up and down, the mouth chatters and the dial still rings. The funny thing is kids will have no idea what it is. When I was a kid this toy was a great primer on how to use a telephone...now it should really be an iPhone with wheels and a pull cord (patent pending by me.) Maybe you can get this for your child and then take them to a history museum and tell them how much it sucked to call a friend who had a lot of zeros in their phone number. The only negative I saw in the Amazon reviews is that the phone cord is super short...I'm assuming that's a safety thing. 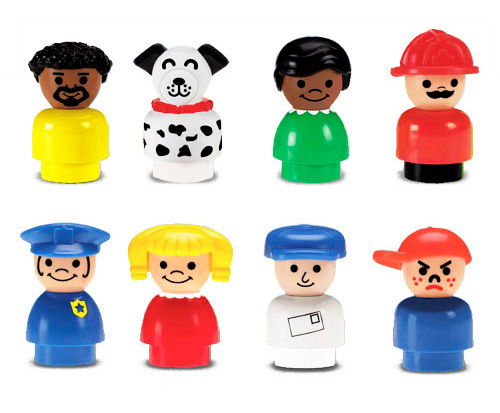 I also noticed that Fisher Price released some of the classic Little People ...my fave was always the mean looking kid with the red hat. Prices of the 4 packs of these are crazy...the 4 pack of the bottom row is $21 while 4 pack of the top row is $6.50 and the 4 pack with the king, queen, dog and girl is $14...hmmm. Fisher Price also released a retro version of the Play n' Go Barn but it got horrible reviews...it's smaller than it used to be, comes with less stuff, the doors don't open and worst of all it doesn't moo. My favorite part of the toy was the moo...I used to be able to imitate it perfectly. So if anyone from Fisher Price reads this please do us some good and release the original barn...thanks. Oh and I know we said we weren't doing a lot of plastic because the whole Montessori thing...but this doesn't count. One last thing...it's a fact that if you make a wish and then click the banner below your wish will come true...and I'll get a vote on Top Baby Blogs. You don't need to do anything but click. Thanks. What a coincidence to come across this post via LinkWithin because just the other weekend when we went to my mum's, she got these out of the loft for my little man to play with in the bath. I had no idea she had kept them! They are so much fun. Did you see that they made little people more squat and fat now? I think it's because the small ones could be a hazard...but we all played with them. I want to get some for Miloh.